Pressure vessels are an inseparable part of the process industry. Many critical reactions need to be carried out in closed vessels at elevated pressures and temperatures. Some reactions can be explosive in nature. Pressure vessels are carefully designed and manufactured equipment to handle such extreme conditions of temperature and pressure. Pressure vessels may theoretically be almost any shape, but shapes made of sections of spheres, cylinders, and cones are usually employed. A common design is a cylinder with hemispherical or torispherical end caps called heads. We manufacture all type of Carbon Steel and Stainless steel Pressure Vessels as per ASME code. We are one of the leading manufacturer of pressure vessels, which are extensively used in various applications of processing industries. 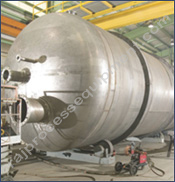 We, at RAJ manufacture the pressure vessels of different types according to the needs of customer.